After years of earning respect from peers and audiences for playing behind better-known artists, noted mandolinist/guitarist Tom Corbett stepped into the spotlight as bandleader and songwriter with his warmly received 2001 solo album Upstairs at Charlie’s. Since then, while remaining a popular sideman, he’s become a frequent presence as frontman of his own well-regarded trio on the coffeehouse, listening room and house concert circuits. Now, with his second album, Cloudless Blue Sky, he’s further establishing himself as one of the most versatile acoustic artists on the West Coast Americana scene. Cloudless Blue Sky declares its distinctions right from the cover, with a sterling list of folk, rock, blues and bluegrass pickers and singers, including first-call players such as multi-instrumentalist Greg Leisz, Los Lobos’ David Hidalgo and Victor Bisetti, harmony master Herb Pedersen and critics’ darlings Robin & Linda Williams. Together with former Desert Rose Band bassist Bill Bryson, harmonicat Tom Ball, singer Jonathan McEuen, bassist Randy Tico, fiddler Phil Salazar, and banjoist Bill Knopf and guitarist David Ferguson from Corbett’s trio, they weave a dynamic musical tapestry with Corbett as he plays in familiar fields of folk, acoustic swing and bluegrass. Longtime fans may be surprised to hear him also venture into blues and reggae. Those only familiar with his good-humored onstage persona will be even more surprised to hear the sober “Hello Dad,” a deeply personal ballad he wrote following his father’s death. It was his father’s Vega banjo-mandolin that inspired 11-year-old Corbett to start picking on old-time standards and absorbing the sounds of Bill Monroe as well as newgrass mando gods like Sam Bush and David Grisman. Those seminal influences can still be heard in his soulful playing. After relocating from his native Ohio to California, high-profile stints with acclaimed folk-bluegrass festival faves the Acousticats and Nitty Gritty Dirt Band multi-instrumentalist John McEuen’s entertaining String Wizards band earned him accolades and a loyal following. 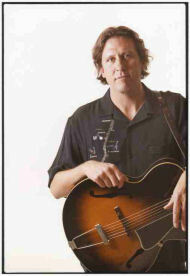 He’s consistently active on L.A.’s acoustic music scene, playing mandolin and guitar with numerous acts onstage and in the studio; he recorded several tracks on Social Distortion frontman Mike Ness’ rootsy solo album Cheating at Solitaire and joined McEuen, Jimmy Ibbotson, singer Jennifer Warnes and Laurie Lewis in the award-winning 2002 DVD Nitty Gritty Surround. More recently he took on one of those only-in-L.A. jobs: teaching TV/film star Tom Selleck how to play ukulele for a role in a play.